12 N e w s / V i e w s M T D J a n u a r y 2 0 1 9 T im Chaney's broad goal is to take Toyo to the masses. Along the way, Toyo Tire U.S.A. Corp.'s vice president of marketing says he will not forget what — and who — have made Toyo such a strong Tier 2 brand in the U.S. Modern Tire Dealer sat down with Chaney and Roy Bromfield, Toyo's president and chief operating officer, at the SEMA (Specialty Equipment Market Association) Show in Las Vegas last year to talk about their plans for 2019. As usual, Toyo's pres- ence on the trade show floor was substantial. "We're going to maintain and defend our strong position for this audience here, the enthusiast audience, through our exist- ing motorsports activities," said Chaney. "All of our drivers are returning, and our participation in all of our races continues. "Our event marketing in the enthusiast world, both UHP and light truck, continues. So we're heavily invested in this world, and we'll continue. at's the first thing." Consumer education is a different story, he said. "Our awareness is not what we would like it to be for the mass market. We're not as well-known as we are in this world. We have a number of initiatives we're working on in the marketing and advertising space with some regional and digital marketing efforts to build our (consumer) awareness. We've got a bit of work to do in that area, but we've got great opportunity as well. "We've been growing primarily through the expansion of our distribution chan - nels. And dealers are doing a great job for us, and we'll continue to invest in our expanding dealer-distribution channels to support those dealers. But direct-consumer marketing and advertising and mass market is what we're working on and looking to expand next year." Bromfield said the company wants to expand on its original equipment fitments. "We have some reasonable positions on a number of Japanese manufacturers, but we look to do more with some of the domestics here. OE positioning really does help build brand awareness, so it's consistent with what Tim was saying in the aermarket. It does give us (more) credibility. And it gives us brand awareness. Working with our Japanese headquarters, Tim's group just completed a major global brand-positioning study. We have many markets in this country and around the world that are still not aware of the brand. Outside Japan it's a global issue. "OE is part of the positioning," said Bromfield. "We have to balance OE and replacement in terms of capacity and where we want to direct capacity." Chaney said the study to which Bromfield was referring also included a "customer-segmentation study," a first for Toyo. 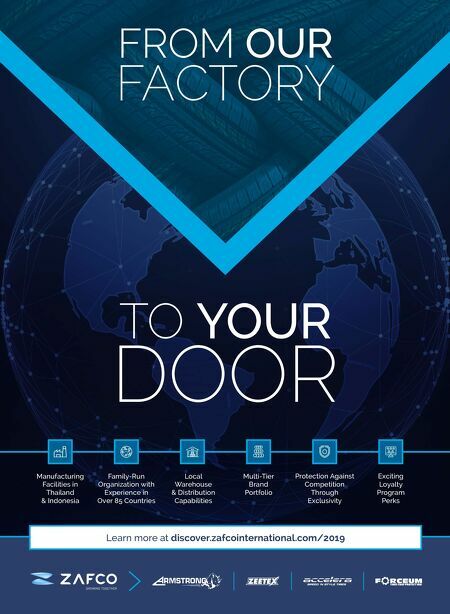 "So we have a better idea who is more predisposed to buy our tire and who should be our target customer. We're still working through that data. "But a lot of the research showed us customers… don't know much about Toyo, but they want to. And we get a lot of credit because of our Japanese heritage. The reputation that Japanese heritage equals quality is one (asset) we have in this business." In 2018, Toyo targeted Dallas as a market with plenty of sales volume growth poten- tial. It had both a strong retailer base and consumers the company wanted to target. Following a five-month integrated, multi-media advertising program that included digital and search-engine market- ing; local television and radio spots; and high-profile "platforms" like the Super Bowl, Academy Awards, NBA finals and NCAA Men's Basketball Tournament, Toyo experienced very positive results. ere were "huge spikes" in volume to Toyo's website, said Chaney. "e Tire- Finder portion of our website, where people are shopping for tires for their own vehicles, spiked 1,150% in that time frame. And we saw that in some of our other markets we targeted as well. "In that five-month concentrated period, we saw enough evidence, both anecdotally from the field as well as the data we had, that if we advertise they will come. We're encouraged, and we'd like to continue and expand markets if possible as we go into 2019." Toyo also is the longest-running sponsor of the Ultimate Fighting Championship (UFC). "We will continue with the UFC," said Chaney. "ey're growing. ey just did a deal with ESPN that starts in 2019. ESPN will expand their awareness and promote them heavily through their powerful media platform. We're really excited about the UFC and ESPN partnership, and what it can do for us as well." 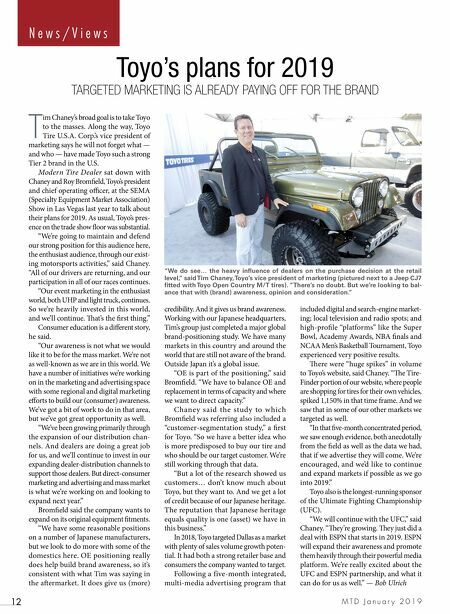 — Bob Ulrich Toyo's plans for 2019 TARGETED MARKETING IS ALREADY PAYING OFF FOR THE BRAND "We do see… the heavy influence of dealers on the purchase decision at the retail level," said Tim Chaney, Toyo's vice president of marketing (pictured next to a Jeep CJ7 fitted with Toyo Open Country M/T tires). "There's no doubt. But we're looking to bal- ance that with (brand) awareness, opinion and consideration."